Wow! If you’ve ever wanted to know what it would be like to hang above Jupiter’s clouds, here you go. This absolutely stunning view of Jupiter’s northern latitudes shows incredible detail of gas giant’s swirling cloudtops. And it features, in the lower left in the image below, the storm on the gas planet known as NN-LRS-1, or more colloquially, the Little Red Spot. The JunoCam imager on NASA’s Juno spacecraft snapped this shot of Jupiter’s northern latitudes on Dec. 11, 2016. Credit: NASA/JPL-Caltech/SwRI/MSSS/Gerald Eichstaedt/John Rogers. Juno’s JunoCam, a visible light camera, is able to get never-before-seen images like this because it is doing something that no other mission to Jupiter has done. Special instruments are studying Jupiter’s radiation belt and magnetosphere, its interior structure, and the turbulent atmosphere, as well as providing views of the planet with spectacular, close-up images. Scientist Candy Hansen is leading this citizen science effort, and she uses the phrase, “science in a fishbowl,” meaning the JunoCam team is showing people what it is like to do science by allowing anyone to participate and see the data as it arrives from Juno. 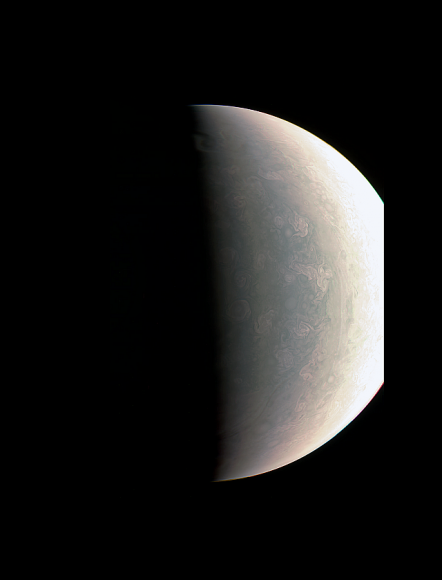 JunoCam is designed to capture remarkable pictures of Jupiter’s poles and cloud tops. Although its images will be helpful to the science team to help provide context for the spacecraft’s other instruments, it is not considered one of the mission’s science instruments. JunoCam was included on the spacecraft specifically for purposes of engaging and including the public. The Little Red Spot is the third largest anticyclonic oval on the planet, which Earth-based observers have tracked for the last 23 years. An anticyclone is a weather phenomenon with large-scale circulation of winds around a central region of high atmospheric pressure. They rotate clockwise in the northern hemisphere, and counterclockwise in the southern hemisphere. The Little Red Spot shows very little color these days, just a pale brown smudge in the center. Back in 2006, the storm was stronger and the color changed darker and more red. Now, with the storm not quite as active, the color is very similar to the surroundings, making it difficult to see. If you’d like to download a larger version of this processed image (need a new wallpaper?) you can find it on NASA’s website. Juno is sending data from Jupiter back to us, courtesy of the Deep Space Network, and the first images are meeting our hyped-up expectations. On August 27, the Juno spacecraft came within about 4,200 km. (2,500 miles) of Jupiter’s cloud tops. All of Juno’s instruments were active, and along with some high-quality images in visual and infrared, Juno also captured the sound that Jupiter produces. Juno has captured the first images of Jupiter’s north pole. Beyond their interest as pure, unprecedented eye candy, the images of the pole reveal things never before seen. They show storm activity and weather patterns that are seen nowhere else in our solar system. Even on the other gas giants. The visible light images of Jupiter’s north pole are very different from our usual perception of Jupiter. People have been looking at Jupiter for a long time, and the gas giant’s storm bands, and the Great Red Spot, are iconic. But the north polar region looks completely different, with whirling, rotating storms similar to hurricanes here on Earth. The Junocam instrument is responsible for the visible light pictures of Jupiter that we all enjoy. But the Jovian Infrared Auroral Mapper (JIRAM) is showing us a side of Jupiter that the naked eye will never see. Even when we’re prepared to be amazed by what Juno and other spacecraft show us, we are still amazed. It’s impossible to see Jupiter’s south pole from Earth, so these are everybody’s first glimpses of it. Beyond the juicy images of Jupiter are some sound recordings. It’s been known since about the 1950’s that Jupiter is a noisy planet. Now Juno’s Radio/Plasma Wave Experiment (WAVE) has captured a recording of that sound. Oddly enough, that’s pretty much exactly what I expected Jupiter to sound like. Like something from an early sci-fi film. There’s much more to come from Juno. These images and recordings of Jupiter are just the result of Juno’s first orbit. There are over 30 more orbits to come, as Juno examines the gas giant as it orbits beneath it.